Looking toward entrance to cave. Ainsworth Hot Springs attracts visitors from around the world, eager to take a dip in mineral waters and explore a cave filled with stalagmites and stalactites. 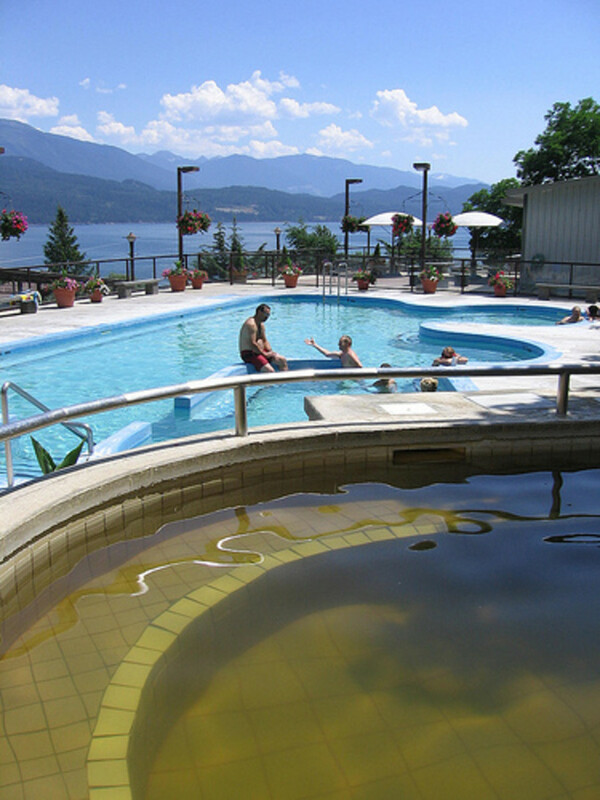 The hot springs are located in the beautiful West Kootenay region of British Columbia, Canada, overlooking the main arm of Kootenay Lake, a spot where breathtaking mountains are almost as enticing as the warm waters that await visitors. 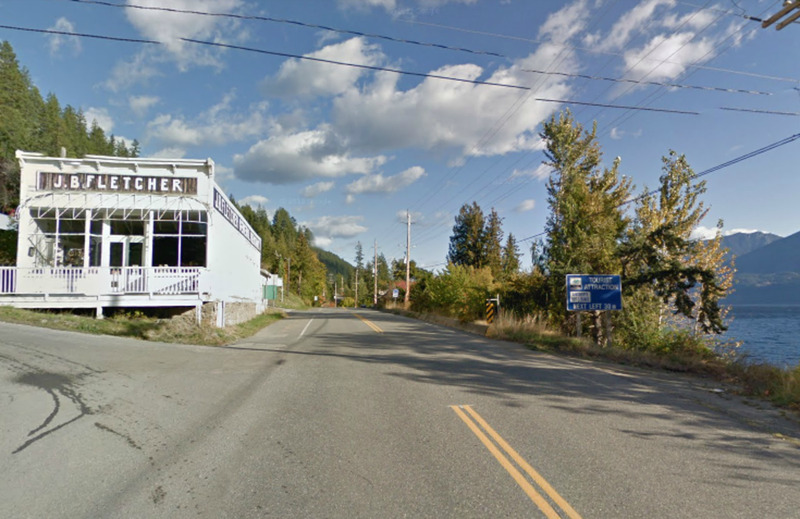 Travelers go north of Nelson, B.C. 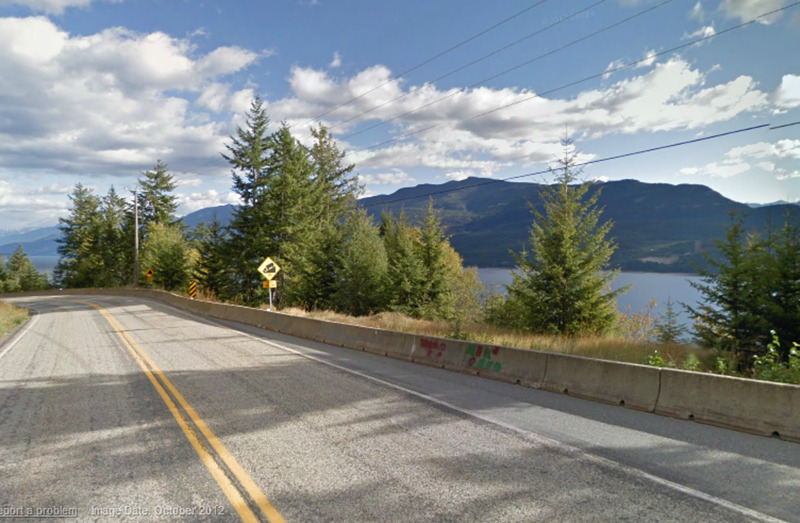 or south from Kaslo and are treated to some incredible mountain views along the way. Stretches of the highway are winding and narrow with sheer cliff-faces on one side and dizzying drops on the other. Carved out of the mountainsides, the road may not be for the faint of heart but the hot springs that await are well worth the trip. 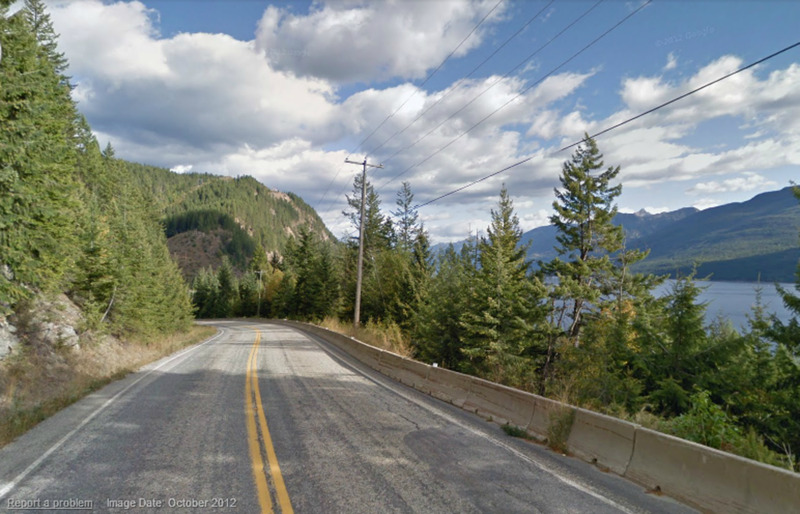 Grab the yellow icon and drag it to the road area, then click on the arrows to travel the highway to Ainsworth to get a feel for Kootenay country. Photo: Traveling north along highway 31. Locals are familiar with the curve ahead which descends to a bridge. Photo: Visitors pass J.B. Fletcher Store, a reminder of days gone by. The modern-day resort offers 43 rooms for lodgers and is open year round. The Springs Dining Room provides two menus a year, offering a line-up of homemade dishes prepared by a chef, using in-season, locally grown food. Diners can sample a selection of fine B.C wines. Floor to ceiling windows add to the dining experience, capturing views of the mountains and lake and the pool down below. A gift shop offers bathing attire and other souvenirs. Where Do the Waters Originate? 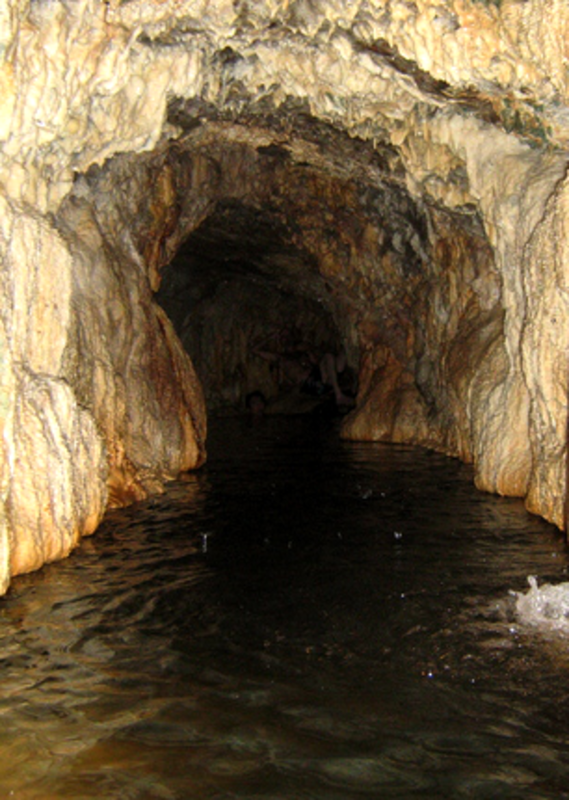 The geothermally heated water has its source in the Cody Caves system, nearby. It travels downward to a fault and then is forced upwards by means of hydraulic pressure. It surfaces at Ainsworth at a temperature of approximately 47C/117F and is cooled to approximately 42C/108Fprior to entering the cave. Evidence of this geothermal activity is evident, as seen by minerals at the side of the highway and in the mountainside up above the cave area. Any place where warm, mineral-laden water surfaces, formations become apparent. The waters are the warmest inside the cave. Water streams in, in various spots, and also drips from the ceiling, plus there's a natural water shower in one part of the cave. Those who enter are treated to a steam bath as they wade through waist-deep water while exploring the horseshoe-shaped cave. Because of the continual movement of water flowing through the area, the water is changed naturally every couple of hours. 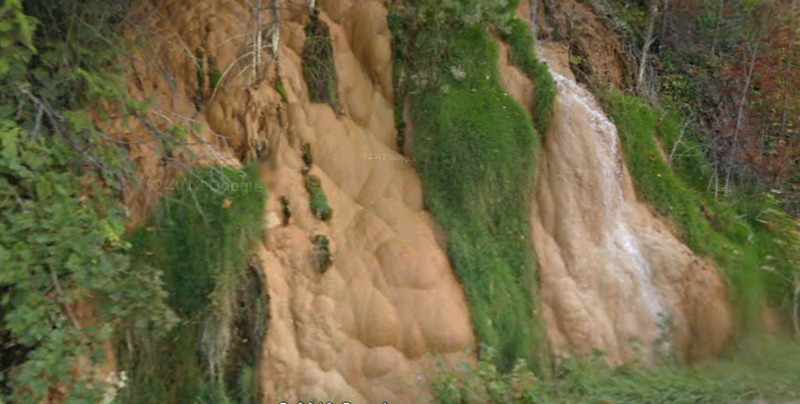 Photo: Mineral formations at side of highway at Ainsworth, B.C. Main Pool--Outside the cave, in the main outdoor pool, the temperature stays at around 35C/96F. 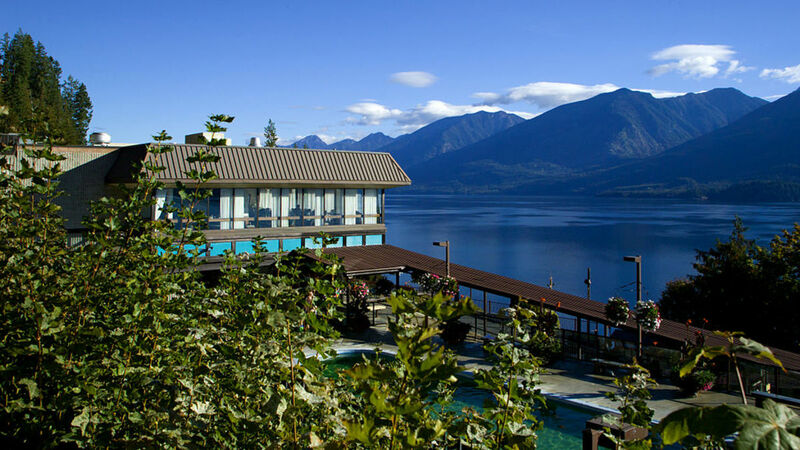 Visitors can swim or soak in the warm water and take in views of the magnificent Purcell mountains overlooking Kootenay Lake. Many alternate between the cave and main pool, coming outside to cool off from the intense close heat inside the cave. Cold Plunge Pool--Not for the faint of heart, the smaller cold plunge pool offers frigid stream-fed water for those brave enough to try it. The cave and pool is a favorite spot for locals who often stay until closing time. 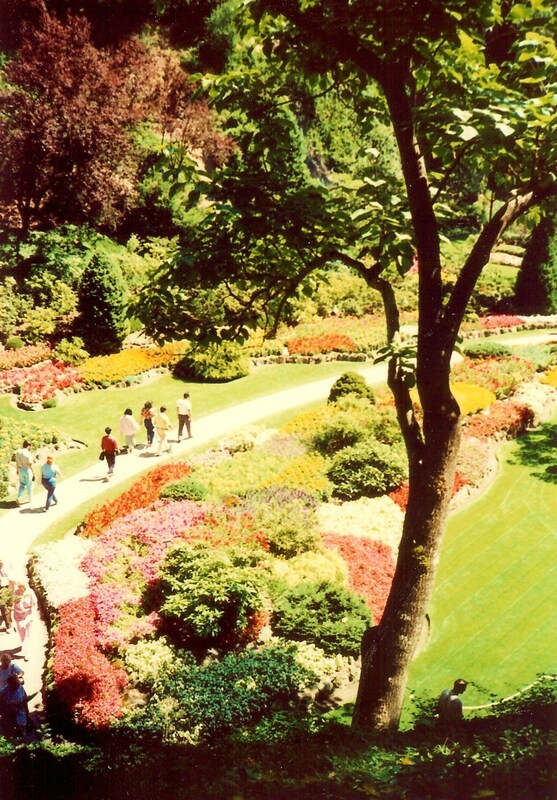 Many visitors from the U.S. make a yearly trip up to Ainsworth to enjoy all that the resort offers. The resort is a favorite honeymoon spot. Photo: Main Pool Ainsworth, B.C, and pool in front of cave area. Have You Visited Ainsworth Hot Springs? Exploring the 150-foot horseshoe-shaped cave is a must. The water is waist deep through the different tunnels and chambers and the cave is like a natural sauna of sorts. The formations are impressive but caution is necessary because these are rough. At the back of the cave, a natural ledge provides a seating spot for those who want to take it all in. Water pours in, in this area, and is hot to the touch. The heat is so intense, most visitors cannot stay in this part of the cave for more than 5-15 minutes. 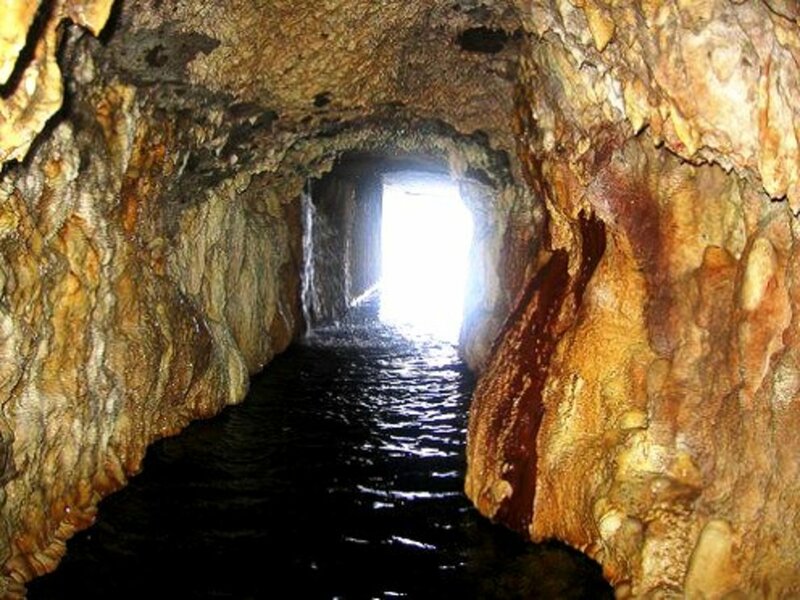 It's quite the experience to navigate the echoing tunnels and continue further into the cave with warm waters caressing your calves as you walk through dimly-lit passageways and inner chambers that wind their way throughout. 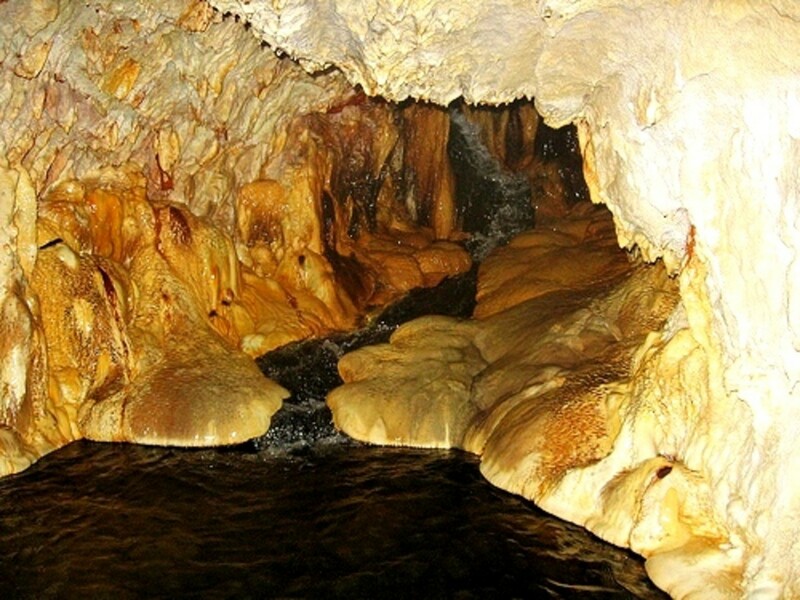 Water drips from the ceiling, sounds echo, and intriguing mineral formations crust walls and ceiling areas. The cave is a delight for newcomers to Ainsworth. Locals visit again and again. And couples find the darkened corners a favorite spot for a little romance. Visitors marvel that this particular hot springs has a cave just waiting to be explored. 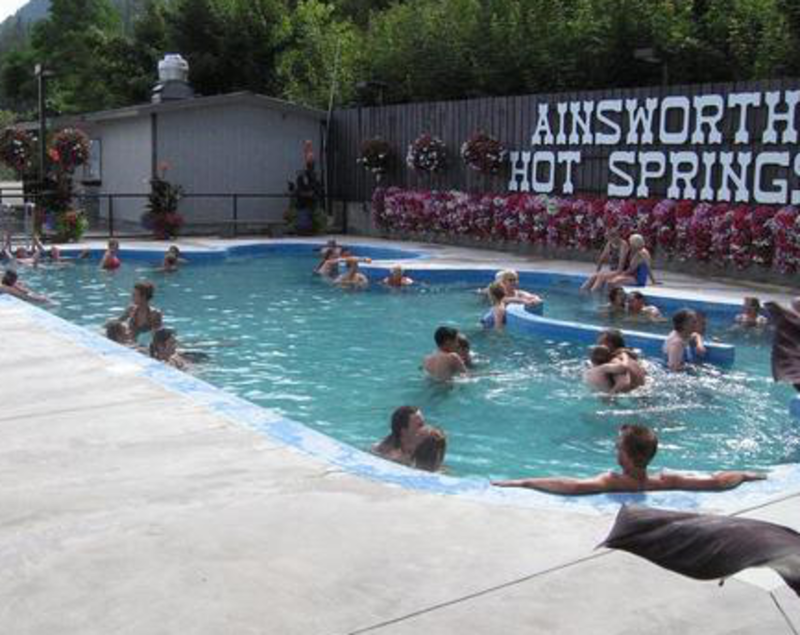 Ainsworth is considered one of the best hot spring resorts in B.C. And it's not hard to see why. At the back of the cave, visitors can sit where extremely hot water runs into the cave. Have You Explored the Cave? 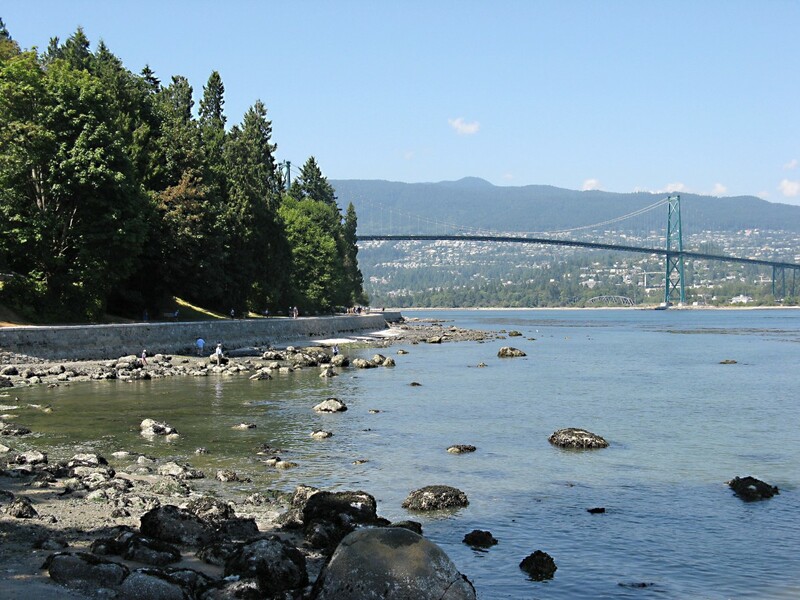 The waters offer a high concentration of minerals but are odorless. One Christmas a bunch of us traveled out to Ainsworth. It was evening and the snow was gently falling. The pool area had been decorated with Christmas lights. The water was glassy and mist and steam rising from the water created a magical effect. A Ukrainian choir had discovered the acoustics inside the cave and decided to practice Christmas carols. They raise their voices in song. The rest of us were captivated to hear beautiful singing emanating from the cave. While no one could understand the words, we all recognized the familiar tunes. Drawn as if by a magnet, every person left the main pool and gathered in the small pool in the front of the cave to listen. While we couldn't understand the words, the carols were easily recognizable. There we stood in awe and soon we joined our voices with the choir and sang along in English. There was such a feeling of kinship with those singers. That was the best Christmas gift that year. 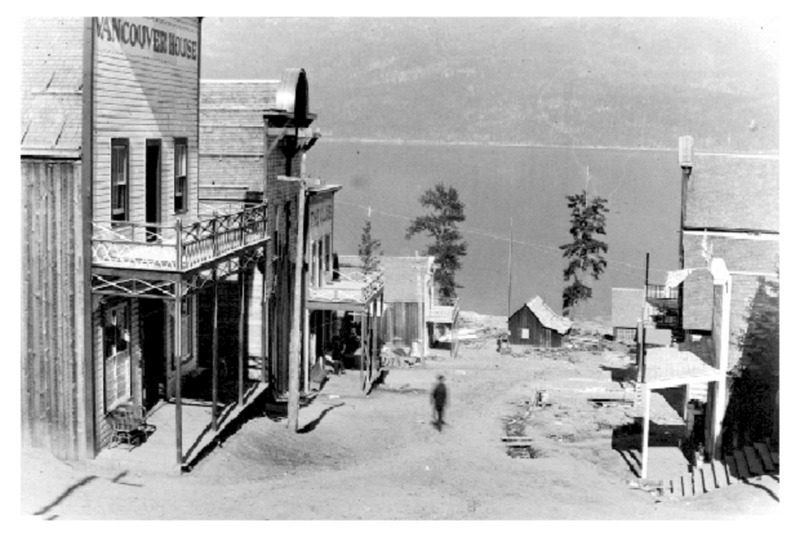 Ainsworth is considered to be the best commercially developed hot springs in British Columbia. While the hotsprings are enchanting at any time of the year, regulars believe that the best way to experience the soothing mineral waters is to take a dip in the colder months. As temperatures drop, the springs and cave offer a unique and warm winter get-away. It truly is beautiful. 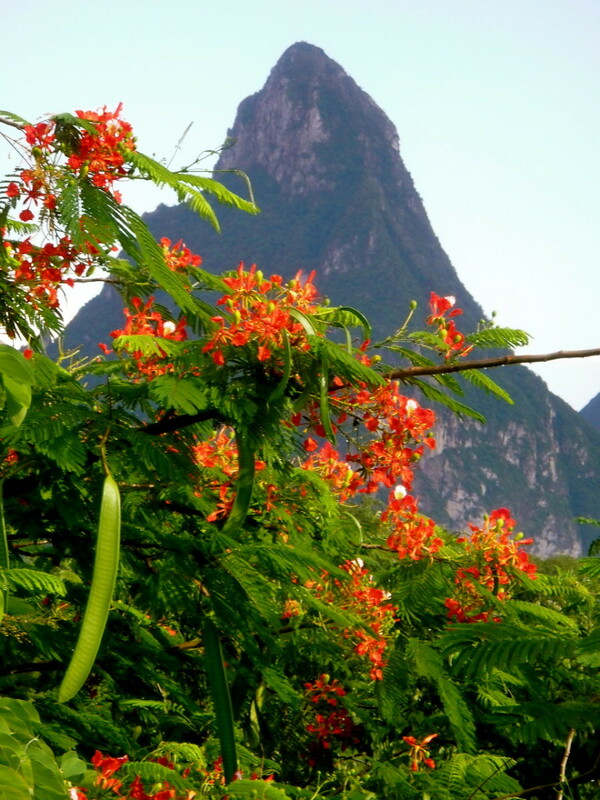 One can soak in the hot springs and look out on the magnificent mountains. Such incredible scenery. It's one of the favorite spots for locals, and many times, while I've been there, people have related that they travel from other places every year to visit Ainsworth. One of the many things I wished I could have done while living in the Seattle area was to visit Ainsworth, and for that matter, the entire Kootenay Region. The Pacific Northwest is so spectacular! It's one of my favorite spots. I was fortunate to grow up near the area and this was a great way to spend an afternoon or evening. Incredible and must be such a pleasure to be there. Sounds absolutely beautiful! 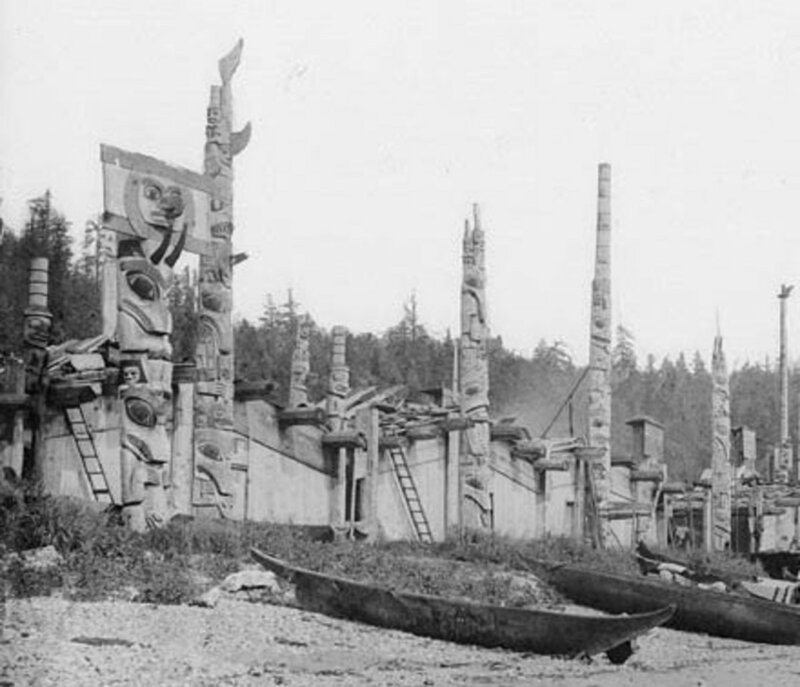 I've only been to hot springs once, at Hot Springs Cove on Vancouver Island. It really is an experience!